In Part 2 of my 4 part look at Medieval Lisbon, I explore the city’s oldest building: Sé de Lisbon, Lisbon Cathedral. On day 2 of my visit to Lisbon, I toured its majestic cathedral. I couldn’t have timed it better – there was a torrential downpour the day I visited. What better way to spend a rainy afternoon that traipsing around a medieval cathedral? Construction of the cathedral began in 1147 on the site of a Mosque after Portugal’s first king, Afonso Henriques (1109-1185) and Crusaders conquered the city and banished the Moors. Cool Fact: Lisbon’s first bishop was an Englishman! After the Siege of Lisbon, many Crusaders decided to stay in the city. Gilbert of Hastings (†1166), an English monk who was part of the noble Anglo-Norman family, “de Hastings”, went on to become Lisbon’s first bishop! The Cathedral houses a curious mix of styles: Romanesque, Gothic, Neoclassic and Rococo, and excavations in its cloister point to Roman and Arab influences. Initially, the cathedral was built in a Romanesque design, but at the close of the 13th century, a Gothic cloister was added by King Denis (1261-1325), ‘The Poet King’, who was known for his revitalisation of Portugal. Denis was a keen supporter of Portuguese culture; he encouraged troubadours at his court, published his own poetry and books, declared Portuguese the official language, and engaged in a intense castle and town building strategy. The Gothic additions to Lisbon Cathedral were but a small part of his grand revitalization scheme. In the devastating earthquake of1755, Lisbon Cathedral was ruined. Much of the original structure was rebuilt, giving us the building we see today. The cathedral was purposely made to look intimidating; its front facade meant to mimic a fortress. The reason for that was the cathedral was occasionally used as a military base during the Reconquista. The Gothic ambulatory contains 3 spectacular 14th century tombs: Lopo Fernandes Pacheo, the 7th Lord of Ferreira, depicted holding a magnificent sword. Nearby, is his wife, Maria de Vilalobos, who is shown reading a book of hours. Lastly, there is a tomb dedicated to an unknown Portuguese princess, who is also reading. They’re absolutely beautiful in their detail, and being a dog owner, I noted the love of dogs in these tombs; all 3 with their faithful, furry friends lying happily at their feet. It reminds me of my dog curling up in much the same way at the foot of my bed. It gave these ornate graves a rather touching, personal quality. Currently, there is an archeological dig underway in the centre of the cloisters but you can still walk in the cloister ambulatory and see medieval tombs. I spent about an hour altogether visiting the Cathedral and cloisters. I enjoyed walking around outside yet staying completely dry while a storm raged overhead, wondering if some monk thought the same thing over 800 years ago. I love being in medieval spaces like this, they are so calm and serene. I always try to picture what it would’ve been like for a priest or monk walking these peaceful corridors, knowing that, for the most part, I’m walking the same path they did hundred s of years ago. In spite of its stylistic mash up, Lisbon Cathedral definitely transports you to the Middle Ages. Once you’ve visited the cloisters, you can climb to the top of the cathedral and visit the spectacular treasury, which houses a mini museum full of stunning reliquaries, bishop’s vestments, statues, jewellery, and a receiving room. The objects date from the from the Middle Ages to the 19th century. It’s a small, yet impressive collection. The treasury is also a fantastic spot for taking photos of the nave below. The Cathedral is a popular tourist destination, it’s always busy. Plan to be here for an hour to take it all in. The main part of the cathedral is free to visit, the medieval cloisters have a €4 entry fee. When I visited, the cloisters were not open to the public until 2pm, so I had to return later, however, the rest of the cathedral is open from 9:00-19:00 daily. 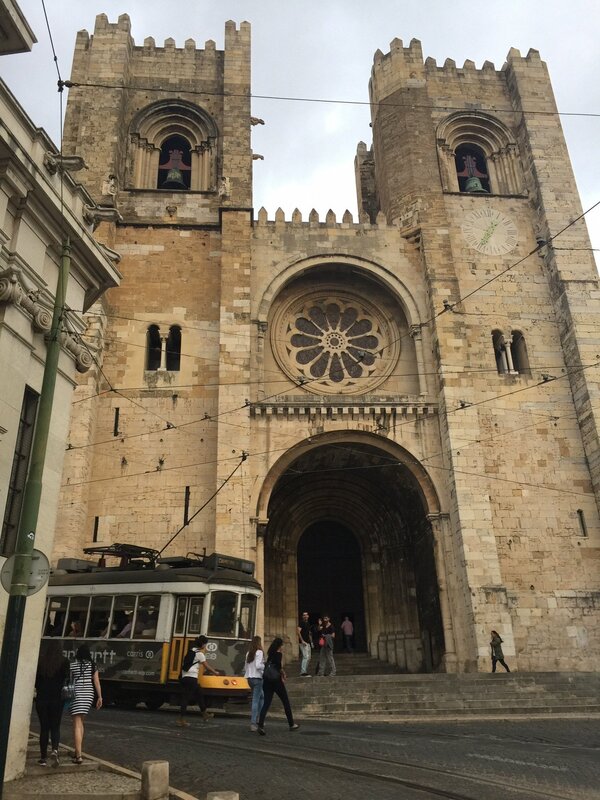 To reach Lisbon Cathedral, you can take the famed Tram 28 that takes you on a scenic journey around the city centre, with the cathedral on part of its route, or get some exercise and walk the city’s steep, hilly streets to visit this beautiful medieval church.